We witnessed long and harsh days without the pleasure of competitive League of Legends after the exciting All-Stars tournament 2017 but right before the mood of many Western fans becomes sad and gloomy the EU LCS Spring Split 2018 will kick in again with Week 1 of a new astonishing season. All teams have finally finalized their rosters and some former stars of the European LCS are now spending their professional League of Legends future in North America. But this means also that there is fresh blood in the European scene and success-hungry newcomers will get their chance to prove themselves on the big stage – the apparently weakened region will again recover after the departure of some strong players as it did in the past. While the FC Schalke 04 team and the Giants! were able to re-qualify for the upcoming Spring Split the favourites of G2 Esports are once more the hunted ones if you want to conquer the Season 8 crown of the European region. In addition to earning Championship points for the upcoming 2018 LoL World Championship all participating teams will also be competing for the chance to play at the Mid-Season Invitational 2018 tournament. Furthermore another change hit the European league: Best-of-1 matches are back in professional League of Legends. Whether you approve or hate these changes, the shorter duels should be more exciting and fun for all viewers. Week 1 of the 2018 LCS Spring Split will start on January 19th, 2018 and will be the first test of strength for the European challengers. So make sure you will turn on your live streams on time at 6:00 PM CEST for more breathtaking action on Summoner's Rift. With G2 Esports and the Misfits the two probably strongest European teams of last season will launch the Spring Split 2018 but the actual strength of all participating teams is difficult to estimate after some fundamental roster changes. Maybe the first week of play can give us an insight into the EU LCS trend for season 8. In addition to G2 Esports, Fnatic and surprisingly the FC Schalke 04 team are also considered to be candidates for winning the Spring Split 2018. No roster changes known for Week 1 of the EU LCS Spring Split 2018. All major betting sites are already providing bets and odds for the upcoming matches of Week 1 of the LCS 2018 Spring Split, furthermore you can also bet your money on the overall winner of the Spring season. As always you will find a comparison of the most important League of Legends bets and betting odds of our renowned eSports betting providers right here. The betting odds listed below are always subject to change, just take a look at our LoL LCS 2018 betting odds site or follow the links to the betting sites for up-to-date information. You will find detailed predictions and analysis of the upcoming matches of the EU LCS Spring Split 2018 – Week 1 right before the first game of the week. The Spring Split 2018 of the eighth LCS season kicks off with a banger because in the first game of the first day of the new seasonwe get to see the two LoL World Championship participants G2 Esports and Misfits Gaming play against each other. Both teams see themselves as having good chances for the overall victory of the Spring Split and want to confirm these claims in their first match. After winning four consecutive splits in a row, G2 is now facing a test of strength as 4 former players left the team during the winter break. The loss of the botlane is particularly painful (Zven and Mithy joined Team SoloMid of the NA LCS). Only on the Jungle position most people agree that it's more like an upgrade: Trick was replaced by Jankos, who has been considered one of Europe's best junglers for the last splits. Misfits Gaming changed only on two positions (more about the changes of players in the EU LCS 2018) and was able to keep two top players in their roster with Maxlore and Hans Sama. The two of them were the main reason why the team beat TSM in the 2017 LoL Worlds Group Stage and brought SK Telecom T1 to the brink of defeat. The G2 botlane, consisting of Hjärnan and Wadid, showed promising performances in the summer split of 2017, but will have to improve further if the team wants to become king of Europe again. A decisive point in the first game of the season will also be which team is better able to read the new meta and may have prepared some surprising picks. In addition, many are already expecting three mandatory bans for the new patch: Ornn, Zoe and Ezreal. If Misfits leaves one of these champions open, it could have serious consequences. Prediction: The real strength of the two teams is still difficult to assess, both have strong single players and work well as a team in theory. I expect a very balanced game, but ultimately a 1-0 victory for G2 Esports. Prediction: The duel between Vitality and H2K will give you a glimpse of which team should prepare for the last place in the Spring Split. On the paper it looks at least as if Vitality could have signed the slightly better players. The odds are also very clear in this duel. I expect a 1-0 victory for Team Vitality. Unicorns of Love vs. Giants! Predictions: The Unicorns of Love are still in the Top-5 of the European teams, even though a lot has changed and the new synergy has yet to be shown. Against the Giants it should be enough, I expect a clear 1-0 victory for UOL. The second game of the first matchday in the EU LCS 2018, which we want to take a closer look at, is the match between ROCCAT and FC Schalke 04 Esports. Roccat had performed well on a regular basis in Season 7, and especially the victories against G2 Esports and Fnatic have been remembered by many fans. Unfortunately the roster was almost completely disbanded, only jungler Memento is left. Even the coach signed for G2 Esports together with Botlane Hjärnan & Wadid. On the other side, FC Schalke 04 is an absolute top team. After a long year in the Challenger Series, especially AD-Carry Upset is eager for his debut in the EU LCS. With Vizicsacsi, Nukeduck and VandeR, the club has also hired three very experienced players to guarantee a top spot for the first season. With the current roster, Roccat will have little to counter the LoL team of the German football club. Upset and Norskeren (Roccat) played together for Schalke in the Summer Split of the EU CS 2017 and made it to the LCS. Many experts said that Norskeren would not yet play at LCS level, but he will try to prove everyone wrong in the coming split. The betting odds speak volumes in this match as well, everyone expects a clear victory for Schalke 04 in this game, after all the team is also a candidate for the LoL Worlds 2018, even if it is still a few months away. We are looking forward to seeing where both teams will be able to be ranked for the rest of the season. Predictions: The pressure on the shoulders of Schalke 04 is very high, everyone expects an obligatory victory in this first match. But I don't think that the key players, due to their experience, will show any nervousness. Schalke will dictate the game and give Roccat players no chance. I expect a 1-0 victory for FC Schalke 04. 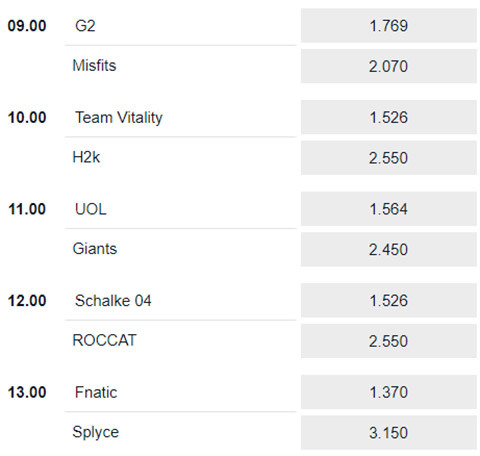 Predictions: In this split, Fnatic is the top favourite for the LCS title. Rekkles, Caps and Co. will try to perform as well as possible on the first matchday so that Splyce will stand no chance. I expect a clear 1-0 victory for Fnatic. Predction: An interesting iteration of the Giant! Gaming Rosters enters the stage of the European LCS in the spring season 2018 – with Steeelback as AD-Carry and Betsy in the mid lane, the spanish team certainly has players who can decide games in favour of the Giants. Nevertheless, the quality of the Vitality roster seems to be higher at first glance, Cabochard was once one of the best top laner in Europe and jungler Gilius is highly appreciated by many experts. Both teams will rather settle in the lower midfield of the LCS, for the first match of the day I expect a 0:1 victory for Team Vitality. The pre-season after the 2017 LoL World Championship has thrown the Splyce squad into a frenzy, now you can only see new players except for AD-Carry Kobbe and the Splyce logo has been improved to celebrate the new season. The synergy between Jungler Xerxe and top laner Odoamne in particular will have a drastic effect on the team's success. Xerxe was already known for his aggressive jungling style in the Unicorns of Love and will now meet his old employers on the second matchday of the first week. Odoamne was considered to be perhaps the best toplaner in Europe, especially in the 6th season, and was able to make a name for himself internationally at the World Championship when he reached the semi-finals of the most important tournament of the season with H2K. Support player kaSing is also making another appearance in the EU LCS and mid laner Nisqy is back in his home region after his trip to North America. In general, the roster is very solid and can be placed in the upper midfield of the LCS. But the roster of the Unicorns of Love has changed drastically too, only mid laner Exileh and AD-Carry Samux can be found in the starting line-up again in the year 2018. They are supported by the former jungler of Splyce – Trashy is now heading into the summoner's rift under the name of Kold. Top laner WhiteKnight gains his first professional League of Legends experience as a substitute in the ALTERNATE team in 2014, when he played mid laner and AD-Carry substitute for his injured teammates. He is regarded as a great talent and we will see whether he can prove himself among the strong European top laner in the spring season. Prediction: We are only at the beginning of the season and without any insight into scrims or previous results, the real strength of these teams is hard to estimate. I expect a 1:0 victory for Splyce. Ey, ey, ey… If you take a first glimpse at the starting line-up of H2K Gaming in the Spring Split 2018, you miss the qualities of the different rosters of the last LCS seasons. Hardly any big names can be found in the roster of the prestigious team that has been playing for the crown in the European LCS since the beginning. Top planner SmittyJ was only able to assert himself in Europe to a limited extent and Santorin's great times with Team SoloMid team are already some years ago – even in the North American Challenger series he was not really able to shine. The roster is completed by some young players from the Challenger series and Caedrel in the mid lane. On paper, H2K Gaming appears to be perhaps the weakest team of the upcoming spring season, but the first games of the season will provide real information. The Fnatic team, on the other hand, is at the top of the list of favourites for the Spring Split victory, only Jesiz has be relegated to the substitution position and was replaced by Hylissang from the Unicorns of Love. The most experienced European top planner, an unconventional jungler, a mechanically strong mid laner and star player Rekkles on the Botlane – the team has what it takes to represent the European region internationally this year. Support player Jesiz was the brain of the team and the rest of the team has show how they get along with the new player on his position, but the acclimatization phase for the experienced Hylissang should not take too long. In this match, the advantages of course lie clearly with Fnatic. Prediction: If there's no meteorite to threaten Fnatic's players and if no one in the favourites' jersey goes blind spontaneously, there should be nothing to stop Rekkles and Co from winning their second game of the week. I expect a clear 1-0 victory for Fnatic. Prediction: If you rebuild a European team before the start of a new season around a single player, mid laner PerkZ is probably at the top of this list. With some strong and well-known players and a new coaching team, G2 Esports is going into the Spring Split 2018, but it is difficult to judge the strength of Team ROCCAT, although they will probably not be able to access the quality of the new G2 Esports roster. I expect a 1-0 victory for G2 Esports. Prediction: In what is probably the most exciting match of the week, Misfits meets FC Schalke 04, both teams are among the favourites for the victory of the Spring Split and FC Schalke 04 is praised by many opponents in the highest tones. Both teams meet at eye level, because of the better chemistry on the part of the Misfits I expect a 1-0 victory for Misfits. Predictions by Addam ‘Canvas’ Burrows, English Literature and Journalism student of 2013. Diamond League of Legends Marksman. Contact Addam ‘Canvas’ Burrows on Twitter!